On her first visit to Telangana after it came into being as a separate state in 2014, the former Congress president said the Congress accorded statehood though it had to pay a price for it. United Progressive Alliance (UPA) chairperson Sonia Gandhi on Friday said the Congress carved out Telangana state, though it had to pay a political price for it. She was apparently referring to the drubbing Congress faced in Andhra Pradesh in Lok Sabha and Assembly elections in 2014. 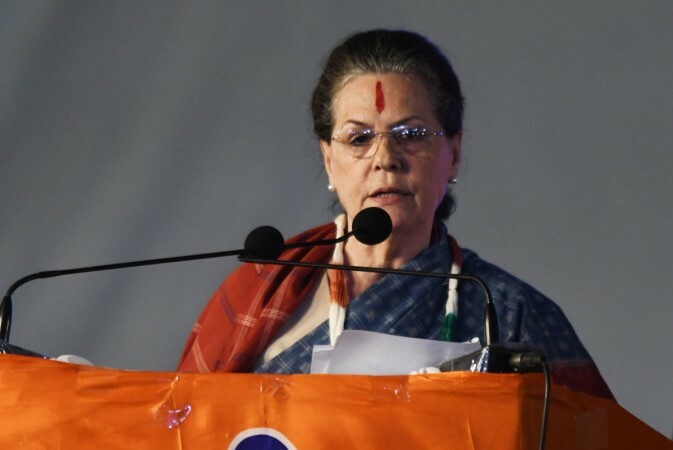 Sonia Gandi was addressing a massive public meeting at Medchal near Hyderabad to formally kick off the campaign of People's Front headed by the Congress for the next month's elections to Telangana Assembly. Gandhi projected herself as the 'mother of Telangana' by stating that she is feeling happy to be in Telangana in the same manner as a mother would feel happy to see her child after many days. "Every mother wants to see her children prosper, but I am pained to see the condition of the new state," she said castigating the Telangana Rashtra Samithi (TRS) government for failing to fulfill the promises at the time of formation of their state. "You know if a newborn is not properly taken care of in the initial years, he has to face many problems in the future. Unfortunately, the responsibility of looking after the child was entrusted to those who only looked after themselves and left the child to fend for itself," said Sonia Gandhi. Stating that elections are an opportunity for people to get rid of this difficult situation, she appealed to people to use the power of the vote to teach TRS a lesson and bring Congress and its allies to power with a huge majority. "I remember what difficulties we had to face in taking a decision to form Telangana state. It was not an easy task," said Sonia Gandhi recalling the passage of bill in Parliament by Congress-led UPA government for bifurcation of Andhra Pradesh. "We kept the interests of both Andhra Pradesh and Telangana before us but your emotions and aspirations gave Dr Manmohan Singh, Rahul Gandhi and others the strength, enabling us to take this big decision," she told a huge gathering amid loud cheers. The Congress leader said they felt the pain of Andhra Pradesh and that was why they announced special schemes and promised special category status to that state. She assured people of Andhra Pradesh that the Congress stands by the commitment it made including the special category status. Recalling that Telangana was achieved on the slogan of "water, funds and jobs", she alleged that TRS failed to live up to the expectations of people. She said people had hoped that the new state would bring about change in their lives but it did so in the lives of those in power and their near and dear ones. Stating that farmers were yet to get water for irrigation, she said their suicides were continuing. Gandhi said the youth were still waiting for jobs. Telugu Desam Party's Telangana unit president L. Ramna, Telangana Jana Samithi's M. Kodandaram and Communist Party of India's state secretary Chada Venkatreddy shared the dais with Sonia Gandhi and Congress president Rahul Gandhi. Rahul Gandhi said the TRS rule was about to come to an end. Without naming TRS president and Chief Minister K. Chandrashekhar Rao, the Congress president said during last five years, one person ran the state at his whims and fancies for the benefit of his family. Rahul Gandhi assured the people that the alliance would fulfill their dreams which Chandrashekhar Rao failed to do. "The government of the alliance will not work for one person but for all the people of the state. It will work to address the problems of farmers, provide employment to youth and carry all sections people with it." The meeting was held the first show of strength by four-party People's Front ahead of December 7 elections to 119-member Assembly.